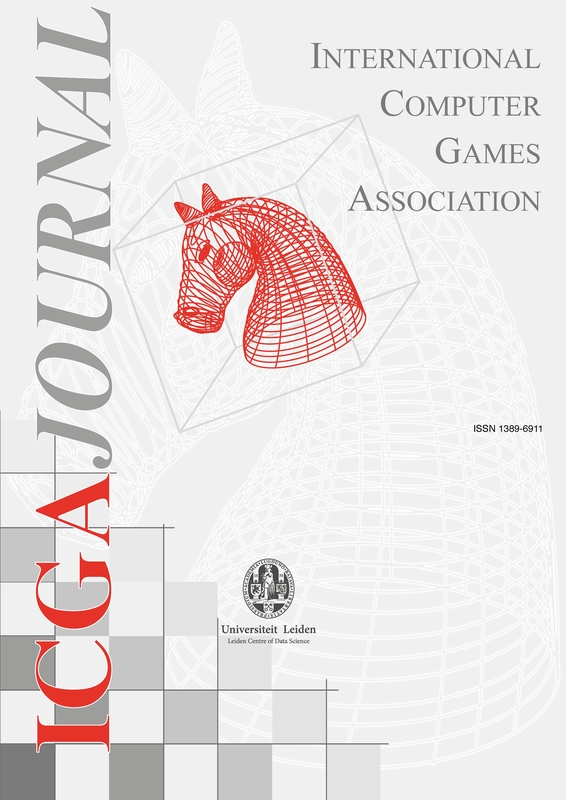 (5) general scientific contributions produced by the study of games. (9) issues related to networked games are invited to submit their contributions. Authors are requested to submit their manuscript electronically to the online submission system : https://submissions.iospress.com/icga-journal/content/submit-manuscript Note that the manuscript should be uploaded as one file with tables and figures included. After the article has been accepted, the following electronic files are required: a word processor file of the text, such as Word or LateX. If using LaTeX, please use the standard article.sty as a style file and also send a pdf version of the LaTeX file as well as separate files of all figures (if any); see "Preparation of Manuscripts" for the required file formats. Manuscripts must be written in English and American spelling should be used consistently throughout the manuscript. Authors whose native language is not English are recommended to seek the advice of a native English speaker, if possible, before submitting their manuscripts. Peerwith offers a language and copyediting service to all scientists who want to publish their manuscript in scientific peer-reviewed periodicals and books. Manuscripts should be prepared with wide margins and double spacing throughout, including the abstract, footnotes and references. Every page of the manuscript, including the title page, references, tables, etc., should be numbered. However, in the text no reference should be made to page numbers; if necessary, one may refer to sections. Try to avoid the excessive use of italics and bold face. Figures Headings and subheadings should be numbered and typed on a separate line, without indentation. SI units should be used, i.e., the units based on the metre, kilogramme, second, etc. Number as Table 1, Table 2 etc, and refer to all of them in the text. All tables should be contained within the manuscript itself, and embedded in the text. Each table should have a brief and self-explanatory title. Column headings should be brief, but sufficiently explanatory. Standard abbreviations of units of measurement should be added between parentheses. Vertical lines should not be used to separate columns. Leave some extra space between the columns instead. Any explanations essential to the understanding of the table should be given in footnotes at the bottom of the table. Number figures as Fig. 1, Fig. 2, etc and refer to all of them in the text. All figures and other graphics should be contained within the manuscript itself, and embedded in the text. Colour figures can be included, provided the cost of their reproduction is paid for by the author. For the file formats of the figures please take the following into account: - line art should be have a minimum resolution of 600 dpi, save as EPS or TIFF - grayscales (incl photos) should have a minimum resolution of 300 dpi (no lettering), or 500 dpi (when there is lettering); save as tiff - do not save figures as JPEG, this format may lose information in the process - do not use figures taken from the Internet, the resolution will be too low for printing - do not use colour in your figures if they are to be printed in black & white, as this will reduce the print quality (note that in software often the default is colour, you should change the settings) - for figures that should be printed in colour, please send a CMYK encoded EPS or TIFF Figures should be designed with the format of the page of the journal in mind. They should be of such a size as to allow a reduction of 50%. On maps and other figures where a scale is needed, use bar scales rather than numerical ones, i.e., do not use scales of the type 1:10,000. This avoids problems if the figures need to be reduced. Each figure should have a self-explanatory caption. The captions to all figures should be typed on a separate sheet of the manuscript. Photographs are only acceptable if they have good contrast and intensity. Authors are requested to use the APA (American Psychological Association) citation style. APA in-text citations should include the author's last name followed by the year of publication. All publications cited in the text should be presented in an alphabetical list of references at the end of the manuscript. Submitted articles can be listed as (author(s), unpublished data). See their website for more information. Authors are responsible for checking the accuracy of all references. Manuscripts will not be considered if they do not conform to the APA citation guidelines. Anderson, A. K. (2005). Affective influences on the attentional dynamics supporting awareness. Journal of Experimental Psychology: General, 154, 258–281. Anderson, A. K., Christoff, K., Panitz, D., De Rosa, E., & Gabrieli, J. D. E. (2003). Neural correlates of the automatic processing of threat facial signals. Journal of Neuroscience, 23, 5627–5633. Armony, J. L., & Dolan, R. J. (2002). Modulation of spatial attention by fear-conditioned stimuli: An event-related fMRI study. Neuropsychologia, 40, 817–826. Beck, A. T., Epstein, N., Brown, G., & Steer, R. A. (1988). An inventory for measuring clinical anxiety: Psychometric properties. Journal of Consulting and Clinical Psychology, 56,893–897. Calvo, M. G., & Lang, P. J. (2004). Gaze patterns when looking at emotional pictures: Motivationally biased attention. Motivation and Emotion, 28, 221–243. Carretie, L., Hinojosa, J. A., Martin-Loeches, M., Mecado, F., & Tapia, M. (2004). Automatic attention to emotional stimuli: Neural correlates. Human Brain Mapping, 22, 290–299. The corresponding author of a contribution to the journal will receive a complimentary PDF Author’s Copy of the article, unless otherwise stated. This PDF copy is watermarked and for personal use only. A free PDF copy will not be provided for conference proceedings and abstract issues. An order form for a PDF file without watermark, reprints or additional journal copies will be provided along with the PDF proof. If you wish to order reprints of an earlier published article, please contact the publisher for a quotation. IOS Press, Fax: +31 20 687 0019. Email: editorial@iospress.nl.